We propose a Grand Unified Theory of Flavour, based on SO(10) together with a non-Abelian discrete group S4, under which the unified three quark and lepton 16-plets are unified into a single triplet 3′. The model involves a further discrete group ℤ 4 R × ℤ 4 3 which controls the Higgs and flavon symmetry breaking sectors. The CSD2 flavon vacuum alignment is discussed, along with the GUT breaking potential and the doublet-triplet splitting, and proton decay is shown to be under control. The Yukawa matrices are derived in detail, from renormalisable diagrams, and neutrino masses emerge from the type I seesaw mechanism. A full numerical fit is performed with 15 input parameters generating 19 presently constrained observables, taking into account supersymmetry threshold corrections. The model predicts a normal neutrino mass ordering with a CP oscillation phase of 260°, an atmospheric angle in the first octant and neutrinoless double beta decay with m ββ = 11 meV. We discuss N2 leptogenesis, which fixes the second right-handed neutrino mass to be M2 ≃ 2 × 1011 GeV, in the natural range predicted by the model. 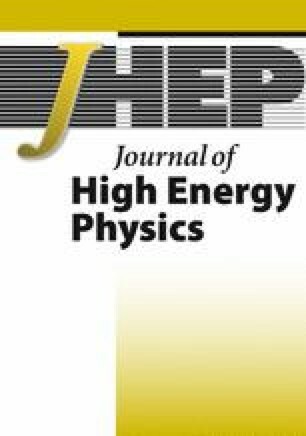 An erratum to this article is available online at https://doi.org/10.1007/JHEP04(2019)069. Particle Data Group collaboration, C. Patrignani et al., Review of particle physics, Chin. Phys. C 40 (2016) 100001 [INSPIRE]. Super-Kamiokande collaboration, Y. Fukuda et al., Evidence for oscillation of atmospheric neutrinos, Phys. Rev. Lett. 81 (1998) 1562 [hep-ex/9807003] [INSPIRE]. SNO collaboration, Q.R. Ahmad et al., Direct evidence for neutrino flavor transformation from neutral current interactions in the Sudbury Neutrino Observatory, Phys. Rev. Lett. 89 (2002) 011301 [nucl-ex/0204008] [INSPIRE]. P. Ramond, The family group in grand unified theories, hep-ph/9809459 [INSPIRE] [C79-02-25]. S.F. King and G.G. Ross, Fermion masses and mixing angles from SU(3) family symmetry, Phys. Lett. B 520 (2001) 243 [hep-ph/0108112] [INSPIRE]. S.F. King and G.G. Ross, Fermion masses and mixing angles from SU(3) family symmetry and unification, Phys. Lett. B 574 (2003) 239 [hep-ph/0307190] [INSPIRE]. S.F. King and M. Malinsky, A4 family symmetry and quark-lepton unification, Phys. Lett. B 645 (2007) 351 [hep-ph/0610250] [INSPIRE]. S. Morisi, M. Picariello and E. Torrente-Lujan, Model for fermion masses and lepton mixing in SO(10) × A 4, Phys. Rev. D 75 (2007) 075015 [hep-ph/0702034] [INSPIRE]. I. de Medeiros Varzielas, S.F. King and G.G. Ross, Tri-bimaximal neutrino mixing from discrete subgroups of SU(3) and SO(3) family symmetry, Phys. Lett. B 644 (2007) 153 [hep-ph/0512313] [INSPIRE]. S.F. King and M. Malinsky, Towards a complete theory of fermion masses and mixings with SO(3) family symmetry and 5 − D SO(10) unification, JHEP 11 (2006) 071 [hep-ph/0608021] [INSPIRE]. G. Altarelli, F. Feruglio and C. Hagedorn, A SUSY SU(5) grand unified model of tri-bimaximal mixing from A 4, JHEP 03 (2008) 052 [arXiv:0802.0090] [INSPIRE]. P. Ciafaloni, M. Picariello, E. Torrente-Lujan and A. Urbano, Neutrino masses and tribimaximal mixing in minimal renormalizable SUSY SU(5) grand unified model with A 4 flavor symmetry, Phys. Rev. D 79 (2009) 116010 [arXiv:0901.2236] [INSPIRE]. I.K. Cooper, S.F. King and C. Luhn, SUSY SU(5) with singlet plus adjoint matter and A 4 family symmetry, Phys. Lett. B 690 (2010) 396 [arXiv:1004.3243] [INSPIRE]. S. Antusch, S.F. King and M. Spinrath, Measurable neutrino mass scale in A 4 × SU(5), Phys. Rev. D 83 (2011) 013005 [arXiv:1005.0708] [INSPIRE]. D. Meloni, Bimaximal mixing and large θ 13 in a SUSY SU(5) model based on S 4, JHEP 10 (2011) 010 [arXiv:1107.0221] [INSPIRE]. T.J. Burrows and S.F. King, A 4 × SU(5) SUSY GUT of flavour in 8D, Nucl. Phys. B 842 (2011) 107 [arXiv:1007.2310] [INSPIRE]. I. de Medeiros Varzielas, G.G. Ross and J. Talbert, A unified model of quarks and leptons with a universal texture zero, arXiv:1710.01741 [INSPIRE]. D.-G. Lee and R.N. Mohapatra, An SO(10) × S 4 scenario for naturally degenerate neutrinos, Phys. Lett. B 329 (1994) 463 [hep-ph/9403201] [INSPIRE]. C. Hagedorn, M. Lindner and R.N. Mohapatra, S 4 flavor symmetry and fermion masses: towards a grand unified theory of flavor, JHEP 06 (2006) 042 [hep-ph/0602244] [INSPIRE]. Y. Cai and H.-B. Yu, A SO(10) GUT model with S 4 flavor symmetry, Phys. Rev. D 74 (2006) 115005 [hep-ph/0608022] [INSPIRE]. T. Geib and S.F. King, A comprehensive renormalisation group analysis of the littlest seesaw model, arXiv:1709.07425 [INSPIRE]. F. Wilczek and S. Dimopoulos, Incomplete multiplets in supersymmetric unified models, NSF-ITP-82-07 (1981). H. Murayama and D.B. Kaplan, Family symmetries and proton decay, Phys. Lett. B 336 (1994) 221 [hep-ph/9406423] [INSPIRE]. P. Nath and P. Fileviez Perez, Proton stability in grand unified theories, in strings and in branes, Phys. Rept. 441 (2007) 191 [hep-ph/0601023] [INSPIRE]. A. Bueno et al., Nucleon decay searches with large liquid argon TPC detectors at shallow depths: Atmospheric neutrinos and cosmogenic backgrounds, JHEP 04 (2007) 041 [hep-ph/0701101] [INSPIRE]. KamLAND-Zen collaboration, A. Gando et al., Search for Majorana neutrinos near the inverted mass hierarchy region with KamLAND-Zen, Phys. Rev. Lett. 117 (2016) 082503 [arXiv:1605.02889] [INSPIRE]. S. Antusch, J. Kersten, M. Lindner, M. Ratz and M.A. Schmidt, Running neutrino mass parameters in see-saw scenarios, JHEP 03 (2005) 024 [hep-ph/0501272] [INSPIRE]. T2K collaboration, K. Abe et al., Combined analysis of neutrino and antineutrino oscillations at T2K, Phys. Rev. Lett. 118 (2017) 151801 [arXiv:1701.00432] [INSPIRE]. NOvA collaboration, P. Adamson et al., Measurement of the neutrino mixing angle θ 23 in NOvA, Phys. Rev. Lett. 118 (2017) 151802 [arXiv:1701.05891] [INSPIRE]. L.J. Hall, R. Rattazzi and U. Sarid, The top quark mass in supersymmetric SO(10) unification, Phys. Rev. D 50 (1994) 7048 [hep-ph/9306309] [INSPIRE]. S. Davidson, Parametrizations of the seesaw, or, can the seesaw be tested?, hep-ph/0409339 [INSPIRE]. Open AccessThis article is distributed under the terms of the Creative Commons Attribution 4.0 International License (https://creativecommons.org/licenses/by/4.0), which permits use, duplication, adaptation, distribution, and reproduction in any medium or format, as long as you give appropriate credit to the original author(s) and the source, provide a link to the Creative Commons license, and indicate if changes were made.